Jake and I were a little late to the spiralized party and didn’t discover the tastiness until a wedding gift opened our kitchen and stomaches to the wonders that are spiralized “noodles.” As an Italian, I couldn’t fathom how “noodles” from a vegetable could come anywhere close to pasta, so I avoided jumping on the zoodle bandwagon as long as possible. Once we received the Kitchen Aid spiralizer attachment, I decided to give it a spin (pun intended) with SkinnyTaste’s shrimp scampi zoodles recipe. Right off the bat, I noticed the ease and speed of recipes involving a spiralizer— a major win during the work week. After serving the dish, Jake and I gave one another a “here goes nothing look” and dove in. With wide eyes, Jake exclaimed, “Wow! This is actually good!” A big deal coming from someone who refused to eat vegetables when we first started dating. Now, two Inspiralized cookbooks and several recipes later, we are officially spiralized coverts. And, dare I say it, but I actually prefer spiralized noodles over pasta now (cue my Italian grandparents rolling in their graves.) The reason for my change of heart? Spiralized noodles are lighter, guilt free, and accentuate the other flavors of dishes. 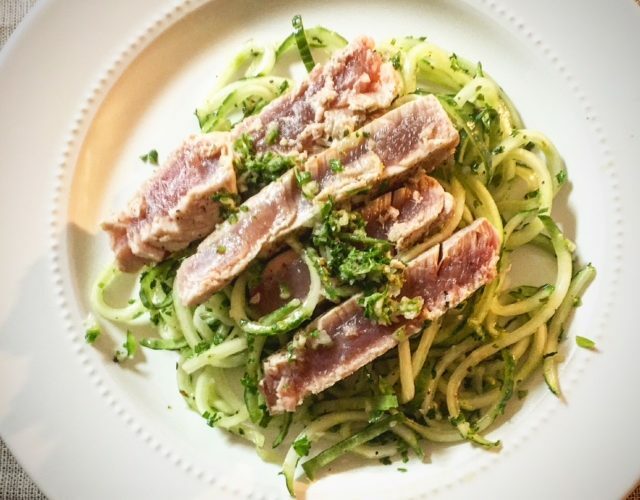 So, that said, I’d like to share one of my favorite spiralized dishes I’ve made thus far, Inspiralized‘s Seared Ahi Tuna with Chimichurri. The recipe calls for cucumber noodles— a mouth watering and refreshing pairing with the seared tuna. Enjoy! 1. Combine all the chimichurri ingredients into a food processor and pulse until creamy. 2. Season the filets generously with salt and pepper on both sides, pressing to adhere. Heat the olive oil in a large nonstick skillet over medium heat. When the oil is shimmering, add the tuna and cook for 1 to 1 1/2 minutes per side, adding the lime juice after you flip them. Remove the tuna from the skillet and slice into 1/2-inch strips. 3. Remove the noodles from the fridge, drizzle over the chimichurri, and then top with the tuna. Drizzle additional chimichurri on top and serve. Have a favorite spiralized recipe? Please share in the comments section below!